The white area of the Infrared Thermal Image to the left lets you see what your horse is feeling and what his behavior might be telling you...that he is experiencing muscle inflamation and damage caused by an ill-fitting saddle. The correct fit of your saddle is critical to your horse’s back health and to his ability to perform the job you have assigned him. Many horses experiencing difficulty with working in ill-fitting saddles, or with incorrectly fitted saddle pads and half pads, display behaviors that are confounding, experience frustrating and expensive 'mystery' lamenesses, and/or are labeled as ‘bad’ when they act out their pain. Think of the topic of saddle fit in this way: a horse being ridden with a too small saddle (narrow in the gullet or the tree) would be like you wearing high-heeled dancing shoes that are too short, too narrow and pinch your toes. It would not take long for you to kick off your shoes or to leave the dance, rather than continue on in pain or to develop blisters. Our horses cannot make the choice to 'leave the dance' or 'kick off their shoes/saddle' (although they might be telling you they wish they could). They must rely on us to correctly choose the equipment we use with them. If there is a problem with the equipment we have chosen, our horse’s bodies and behaviors will communicate their pain. If your horse is displaying antisocial tendencies when being groomed or tacked; has confounded you, your trainer and/or your vet with unidentifiable lameness; or is exhibiting any of the performance challenges listed below, it may be due to back pain relating to saddle fit. Saddle Fit? Let Us Act as Translator. With Infrared Saddle Fit Imaging, Equine BodyWorks Certified Equine Thermographer, Becky Tenges, can quickly and accurately assess your saddle fit to show the contact patterns of your saddle—where it is in greatest contact, and areas exerting uneven pressure, if any. The pre- and post-ride images are expertly reviewed to analyze the fit of the saddle and, if there are fit problems, the effect that the incorrect fit is having on your horse’s back. 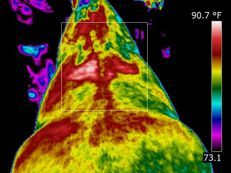 Learn more about how we conduct an Infrared Thermal Imaging Saddle Fit Analysis here and check out answers to Frequently Asked Questions about Thermography on our FAQ page. We are pleased to offer The Best of The Best in saddle fit analysis methodologies. Saddlefit 4 Life® is the world's leader in identifying optimal saddle fit so as to protect both the horse and rider from pain and long term damage. Our onsite diagnostic saddle fit evaluation includes, static and dynamic measurements, evaluation, and analysis; saddle fit diagnosis for both the horse and rider; and recommendations for solutions. Saddlefit 4 Life® is taught at the German National Riding School and the School of Osteopathic Medicine in Germany, as part of their certification programs, and is accredited for USDF University credits. Equine BodyWorks', Becky Tenges, is honored to be joining the global network of Saddlefit 4 Life® professionals, who include Dr. Gerd Heuschmann DVM (author of ‘Tug of War’ and ‘If Horses Could Speak’), Hannes Mueller (Head Instructor at the German National Riding School), Dr. Joanna Robson DVM (Recognizing the Horse in Pain and What you Can Do About It), Barbara Welter-Boeller – Director of the German Osteopathic School, and Dr. James Warson (MD specializing in riders’ health issues; author of ‘The Rider’s Pain Free Back’).